Here at Central Wheel Components, we pride ourselves on being Europe's largest stockist of classic rims. We have been collecting data for over 120 years, and drill the rims in house. So if you can't find what you're looking for - get in touch! Our own brand CWC English Chrome Rim is rolled to a replica of the popular Dunlop rim from the 60's era. Each rim is hand polished prior to being dimpled, drilled, and finally finished with a triple plate to give a deep, lustre finish. 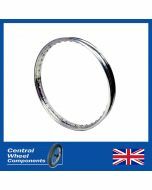 All rims are stamped 'Made in England', and because each is individually made to your requirements, you need to allow for 28 days for delivery.